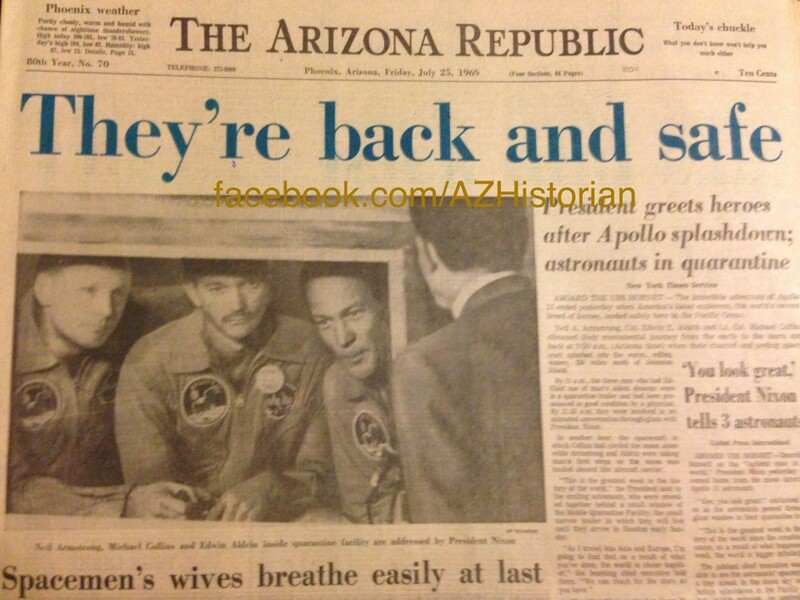 The front page of the July 25th, 1969 Arizona Republic, which featured a headline announcing the safe return of the triumphant Apollo 11 crew. The front page headline of the July 25th, 1969 Arizona Republic announced, “They’re back and safe,” they being the three Apollo 11 astronauts who had splashed down in the Pacific Ocean the day prior, thus completing their heroic “giant leap for mankind.” Terrestrial sites most often associated with the July 1969 moon landing include the Kennedy Space Center near Cape Canaveral, Florida, from which the Moon-bound rocket blasted off on July 16th, and NASA’s Houston, Texas Mission Control Center. However, several Arizona locations number among the lesser known sites tied to the overall success of the Apollo 11 mission specifically and astrogeology in general. 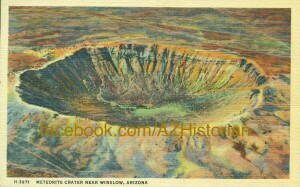 A postcard showing Arizona’s Meteor Crater, one of the many sites visited by NASA astronauts in preparation for the Apollo moon missions of the 1960s and 1970s. While training for lunar missions including Apollo 11, Neil Armstrong and other astronauts visited the Grand Canyon, Meteor Crater, Sunset Crater, and Kitt Peak National Observatory. Cinder Lake and Sunset Crater proved to be important locations for testing technology such as cameras and vehicles to be deployed on the Moon and Flagstaff proudly served as home to the U.S. Geological Survey’s Center of Astrogeology, a significant contributor to NASA’s successful Apollo program. Though now little-known for its role in putting men on the Moon, the Flagstaff area did receive widespread recognition during the historic mission. Notably, CBS assigned several journalists to report on-location from the Flagstaff area during the network’s Apollo 11 coverage. For more information on Arizona’s contributions to the field of astrogeology, please visit http://pubs.usgs.gov/of/2005/1190/of2005-1190.pdf.